I apologize in advance for the lack of brevity, but I'm obviously frustrated and floundering for any solution or workaround. Anyone ever find a resolution to this? I've removed multiple keycaps, wiggled them around a bit, just for good measure, ensured there was no dust or debris of any kind in there... haven't ever spilled any liquids onto my keyboard. It's just started acting up in recent weeks and it's beginning to drive a man mad. I just want to type to the fine folks on teh interwebs and I get stuck with random extra spaces after a word, or double letters repeating without reason or without warning. JUST this evening, using the latest version of iCUE (what a wonderful piece of garbage software, yet again from Corsair -- i typically find their hardware to be alright, for a while I even thought it was pretty decent, but the software has always been nothing shy of horrendous). Anyway, in the past couple months i've had both my Corsair STRAFE mechanical keyboard, with Cherry MX Brown switches begin acting up on me and my VOID Pro Wireless headset (both items were purchased via sales on NewEgg) have decided they wanted to begin sh*tting the bed. How unfortunate. I haven't bothered posting to their forums, as it's pretty much a wretched hive of scum and villainy, but I guess that's the next step before trying to begin the RMA process. I will say, Corsair replaced my bad RAM kit with no questions asked once I sent them the reports i ran via memtest86 and the brand new replacements have been working well... so far. Time will tell, i guess. I thought I was getting a "deal" on these items, but knowing very little about hardware (and headsets) in general, I probably should have tried to do a little more homework. It's really hard to get a feel (no pun intended) for what the various switches are liek until you've had a chance to hammer away on em for a bit. That being said, i re-forced a firmware update for my keyboard and lowered the "Polling rate" down from 1000Hz / 1 msec to 250Hz / 4 msec hoping maybe that'd help things out a bit. No dice. Still getting the exact same behavior. Just exported my system info and logs and will begin trying to track as much information as possible while I attempt to build a case for my RMA process. Not that I want to go weeks, or a month, or more without my keyboard, it'll make it kind of difficult to use my desktop PC, but what other choice do I have at this point. If i had a touch more case of rage-disorder, I would have probably already smashed my speakers on the wall due to this intense frustration. Why is it so difficult to press a button and get a single action? Obviously, I know nothing. I'm not an engineer, nor a mechanical keyboard expert. Wish I still had one of those IBM Model M or whatever those workhorses were that we used when we were growing up. I could have dunked that in the swimming pool and those babies would still survive just fine -- and be a pleasure to use, taboot. Okay, this is getting painful, with all the corrections I'm having to make so I don't sound liek a pleb with my shoddy typing skills. I'm not trying to suggest I'm a 120WPM touch typist or anything, but I get around fine for the most part. Looks liek I'm headed back to one of those freebie keyboards that come with every Dell and HP system you've ever purchased. I think i could build a small home with the stack of free keyboards I have lying around, but I was hoping my initial foray into the mechanical world would be a bit more pleasurable. It was a true delight at first. MASSIVE upgrade from those cheapo pieces of junk, but at least they work when you press the keys and can even survive a spill with some quick cleanup. Would be wonderful if someone had a remedy or solution, or at least a suggestion for this 2+ year old problem. Obviously I'm not alone as the various forums are smattered with same/similar situations -- is it simply an issue with the Cherry MX switches that are used in these keyboards? I knew this was somewhat of an entry level device, but not having used a legit mechanical keyboard since the old IBM Model M days, i figured I'd take advantage of the sale price and see how it went... and i was quite happy for some time. Until these issues began cropping up. Now i'm constantly battling a case of mild rage-disorder. Will seriously have to consider working that into the budget depending upon Corsair's response. Wish me luck. I'll most certainly need it. > Have a reasonably recent Android phone or even an iPhone and want to save a BUNCH of cash on your monthly cellular bill? It's a little complicated, but we're paying less for two lines than most folks pay in a single month and been happily using the #ProjectFi service for more than a year now. It has recently been re-branded as #GoogleFi and you can get a service credit off your bill by signing up with our referral code. EDIT: PLEASE, liek and share this link (and referral code) with anyone who might be interested in saving money on their monthly mobile bill(s). I'd be happy to answer any technical type questions, if I am able, but that article is VERY thorough if you need further details. So the issue is that you have a bad keyboard, you have a few choices. If it's in warranty, get it replaced that way. If it's not in warranty you can buy switches for the keys having issues and solder them in. If you don't want to take the time or can't do the soldering, replace they keyboard. There is no magic solution to failing hardware, the fix is repair or replace. My main computer keyboard is a Corsair with MX Silent switches, have not had any issues with it and it's used quite a bit including my 13 yr old daughter, her friends and little cousin. So Corsair on it's own is not just prone to breaking. Leopold is good, I have one of their keyboard with MX Reds, although I rarely use it, have it on my laptop, this model https://mechanicalkeyboards.com/shop/index.php?l=product_detail&p=3545. You can find pretty good keyboard deals on BestBuy actually, they tend to have older models on sale for good prices. I just got one I like from HyperX using the Kailh Silver Speed switches that I like better than the MX Reds, smoother and a bit faster. Ended up using it at work, along with some o-rings to quite it a bit and smooth out the click sounds. This is a pretty good deal also, you get wired and wireless and real MX switches for $80 https://www.amazon.com/dp/B078218YBY/ref=sspa_dk_detail_2?pd_rd_i=B078218YBY&th=1 if you don't need the number pad. Thank you for the detailed response, @hang-the-9 -- my issue is that i absolutely must have a full ~104 key keyboard with a complete numpad on the side. It's just a personal preference for my desktop. I've managed to live without one on my laptop and I truly miss it, although I do find myself messing things up quite often when PuTTY or some SSH session won't accept or recognize those keys they way I think they should and I end up down a bunch of lines, or have royally messed something up and have to cancel editing my files and begin again. That's really unfortunate to hear, that it's almost certainly a hardware failure which is causing the issue(s). I was hopeful it was something else, as initially it began with simply repeating "f" keys, I'd quite o ften get an "ff" where I didn't want one, but as you can see (previous line, the word "o ften" was a result of this keyboard's problems, so i left it uncorrected, for sake of clarity), the issues are odd because they are inconsistent and have now begun to move around. I was really hopeful I could simply do something to correct the one or two keys that are causing me such grief, rather than having to spring for an entirely new keyboard. I was (at least initially) quite pleased with this STRAFE that I got on sale for right around the same price as the K63 you linked from Amazon... i guess if I'm going to do it all over again, I'd consider spending twice as much to ensure i had a device that would outlive my PC, and hopefully the next one, as well. I'll have to seriously consider the options you've presented me with. I dug out the little keycap remover tool that came in the box: https://i.imgur.com/1mmY8rt.png -- which i hadn't even really taken a look at, and obviously have yet to unpackage the contents and was delusional thinking perhaps I could do something to resolve my little dilemma. Sadly, that doesn't appear to be the case. I checked the original purchase date on NewEgg's site and since it was from summer of 2k17, I'm certain it is beyond the warranty period at this point. Sadly, I guess keyboards don't come with lifetime warranty, as RAM does (even though it took me 2-3+ months, I was able to successfully RMA a 16GB (2 x 8GB kit) from Corsair a number of months ago. No such luck this time, I guess. Thank you again for taking the time to reply and give me some excellent options to begin as a jumping off point. I know very little about the various types of keys, I thought I actually had Cherry MX Reds in my device, because I recall waffling between (what i thought were Reds) and the MX Silents as you mentioned owning. Some folk seem to really enjoy that clickity clack sound when they depress a key, but I'm often working late night hours or even during the daytime when my significant other is trying to consume media and I hate to be interfering in any way possible, and these mechanical keyboards tend to NOT be all that forgiving. Have yourself a wonderful February and I'll probably try to wiggle the spacebar keycap around a little bit more, before embarking upon more serious solutions. At this point I almost wish it'd go back to simply repeating the "f" key, as was the original issue that crept up, but the spacebar malfunctioning is a real drag, as you can surely imagine. I've even considered trying to convert back to any of the small stack of "freebies" I have that were packaged with various Dell & HP PCs over the years, that have somehow stacked up, despite me not really having purchased myself any new hardware since I can remember. I've got a Dell, unopened, still in the original box... but once you go mechanical, i don't know that one can ever really go back. It would definitely be going backwards. Time to add another item to my endless list of research projects. These are a difficult thing to search, as it tends to be purely personal preference, and what works for one person, doesn't always feel great, or even "right" to another. Different strokes for different folks, as they say. Thanks again, sir! Be safe, be nice, be fun. If nothing else, finally ceasing to be merely a lurker and having actually created an account here was the silver lining in an otherwise difficult situation to find anything good that has come from it. I'm tinkering, so don't mind the additional thing i've added below this response. Ta ta for now, kind sir. Thank you for the detailed response, @hang-the-9 -- my issue is that i absolutely must have a full ~104 key keyboard with a complete numpad on the side. It's just a personal preference for my desktop. The reason I linked all those other keyboards is because the one you said you were looking at was an 87 key one. Really there is no shortage of good mechanical keyboards to look at, really depends on the budget. The higher end you go the higher quality electronics you will get, and the stiffer the chasis and construction will be. Many of the keyboards in the lower price ranges, say up to $100, have some rougher sounding and "pinging" sounds from the keys. Most in the $120+ range would not. I bought a few of the under $50 mechanicals from Amazon, had to return all of them because of the metalic ping from keys, it sounded like a small echo of a spring on some of the keys. To be brutally honest, as I already thought I was using Cherry MX Reds with my current keyboard (must be the ridiculous red RGB that was included, as they also had a full color spectrum RGB) if I wanted to pay additional cash -- which i did not, i'd be content to have no RGB on my keyboard, or anywhere for that matter)... but I've apparently been using Cherry MX Browns this entire time. I know nothing. I just want a decently reliable keyboard that doesn't sound liek an elephant stomping around, so I can take work meetings and still type without my headset/mic picking up the sounds of keys clattering away whilst I attempt to furiously take notes during said meetings. Guess perhaps that makes me a candidate for Cherry MX Silents? That was something i had originally considered when I was shopping, but again, i truly do not know the difference, despite having attempted to read up on the various switches prior to making my purchase. I asked for some info from a co-worker, who gave the appearance of knowing quite a bit about a wide range of products, but he was one of those types who thought he knew everything -- i have no idea what kind of keyboard he's using (he showed me, but at this point I couldn't recall for the life of me), but combined with his Yeti microphone which must have sat somewhere semi-close to his desk/keyboard area, it was impossible to try and have a (virtual) conversation with him while he was coding away, because that sound was SO annoying. While I do adore the nice sound of a mechanical keyboard clacking, I could almost fall asleep to that as white noise, if it were produced in a steady stream... I'd rather something a little more practical, as aforementioned, in addition to the numerous late-night computing sessions I inevitably drag myself into, I don't want to be an annoyance if my better half were to be snoozing on the couch one room away. These Cherry MX Browns seem to be almost tolerable, but i'm probably bottoming out the keys more than i care to admit and when i try to have a little bit lighter touch, the keys don't always seem to register... and i've got enough corrections to constantly deal with, that's even prior to the recent malfunction(s) i'm experiencing. Aaargh, so frustrating. 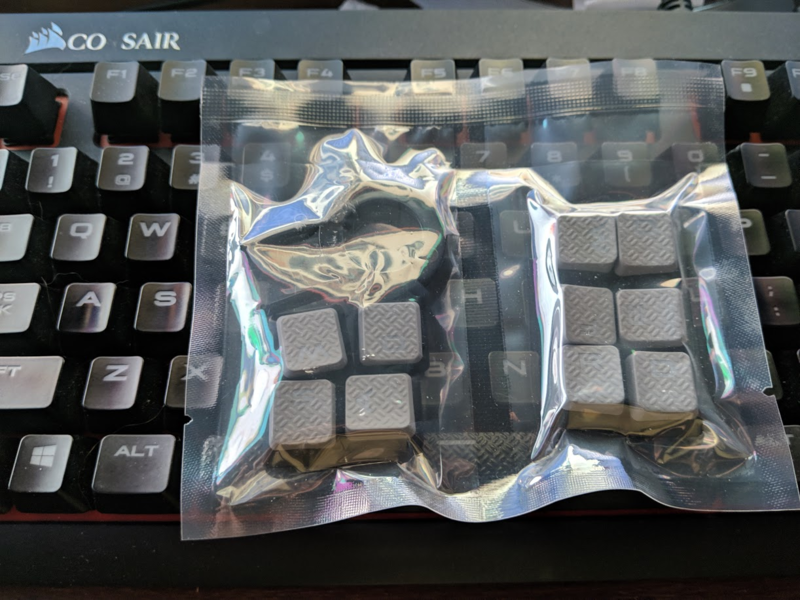 Please correct me if I'm wrong, but the Cherry MX Silents are akin to the Cherry MX Reds, just with some type of rubber dampening, is that anywhere close? Obviously I have much homework to do. Not sure if a new keyboard upgrade is in the budget at the moment, but I began the process of dealing with Corsair Support last evening after we exchanged a couple messages. Wish me luck. Somehow I doubt this will go as smoothly as the RMA of the bad memory kit went... but a guy can hope (or be delusional), right? Thanks again for all the time you are taking to try and help guide me through this process, as the options can be rather daunting when you don't know what yer doing... or probably even if you do. There's a LOT of keyboards and varieties out there, even beyond just factoring in the switch. My only real "must-haves" are the full numpad, and an extra USB port on the keyboard would also come in hand, for quickly being able to access cables for my hardware key(s), or to charge a small device, as the two external USB 3.0 ports on top of the computer case (that rests on the floor next to my desk) are almost always occupied with something. I tend to keep my bluetooth dongle there, as I was a buffoon when selecting my motherboard and didn't factor in the fact that I'd be using quite a variety of bluetooth devices in the very near future. Oh well, ~$20 ASUS adapter later and we're rolling, but it does occupy one of my prime port locations. Perhaps I should try to move it around to the back, but i was concerned with various types of interference and wanted to ensure i had the best connectivity / range with my bluetooth headphones (Bose QuietComfort 35 II). MX Silents are related to the Red, but the feeling and noise are very different. They have a shorter travel than the Red and the noise is about the same as a normal dome switch keyboard like you get bundled with a computer. I like the Browns also, my son have had two keyboards with Brown switches, one a normal MX brand another a cheaper copy and both were pretty good feel, but not very silent. You can always use a cheap set of o-rings on the keys to quiet them a bit and also make the travel shorter and the feel a bit softer. There are generally two hardness types of o-rings, firm and soft. The soft will make the keys bottom out with a soft feel, think of poking a finger in a gel vs rubber, the firmer ones will keep the original key feel better. I suggest you find a store with some keyboards out, BestBuy stores have 4-5 different keyboard out on display usually in their gaming section, and some boxes have the keys in a cut out so you can try it. Amazon and other places also sell a thing called a keytester where you buy a block of different switches to try out, although that won't help you will a good typing feel test since it is a single key. My work keyboard is a HyperX with Kailh Silver Speed switches, which are similar to the MX Silent in feel but are louder, even with o-rings. Very smooth feeling switch though. It sounds a bit like a normal keyboard, no loud clack but not silent like a laptop keyboard would be, with smoother key feel. Based on the keyboard I would probably try another Kailh switch next time I have an itch to get another keyboard. Is this Corsair MMO mouse any good for 2019 gaming? [SOLVED] Best corsair fps gaming mouse?